With Hallmark's Giant Gingerbread Man Cookie recipe, you can create a cookie for each guest attending your holiday gathering—men, women and children. Our easy gingerbread cookie recipe also includes three tasty twists: Iced Rounds, Rum-Tum Gingerbread and Raisin Gingerbread. 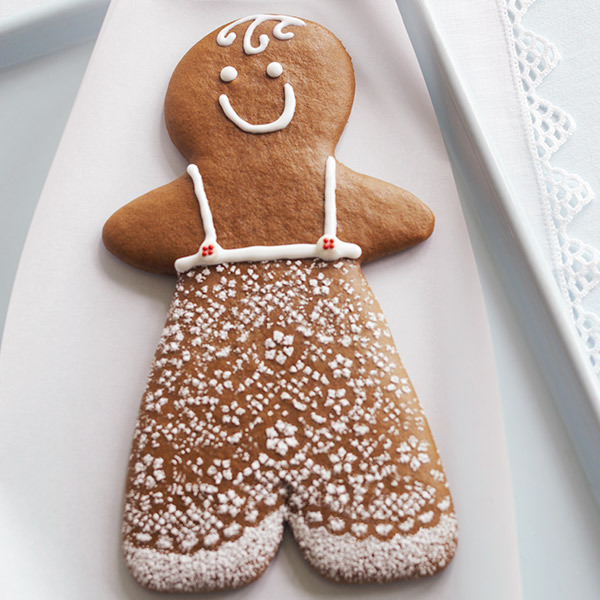 After the cookies have cooled, sprinkle powdered sugar through a doily to make a pretty pattern on their clothing. In a large bowl, blend the shortening, brown sugar and molasses. Stir in the cold water. Stir in the flour, salt, allspice, ginger, cloves and cinnamon. Stir in the baking soda mixture. Cover the dough and chill overnight (or even for days). Preheat the oven to 350°F. Lightly grease a baking sheet or line with parchment paper. Divide the dough in half. On a floured surface, roll out the dough ¼ inch thick. Cut into people shapes with a 7-inch gingerbread cutter. Gather the scraps, reroll, and cut out more cookies. Place far apart on the baking sheet and bake for 11 to 17 minutes. Transfer to wire racks to cool. Make the icing: In a large bowl, blend the confectioners’ sugar and meringue powder. Gradually add 4 tablespoons warm water and beat 3 to 5 minutes, until smooth and glossy. Beat in another tablespoon of water if necessary. Use the icing to pipe details onto the gingerbread. If desired, use a doily and confectioners’ sugar to dust a clothing pattern on the cookies. Tip: Decorate cookies to resemble each guest coming to your holiday dinner and use them as place cards. Cut the dough into 1½-inch rounds. Bake and cool completely. Meanwhile, blend 8 ounces cream cheese, 3 cups confectioners’ sugar, 2 teaspoons cinnamon and 1 teaspoon vanilla. Use 1 teaspoon of icing to lightly frost each cookie. Use 3 tablespoons dark rum instead of water to dissolve the baking soda. Cut the dough into 1½-inch diamond shapes. Bake and cool completely. Meanwhile, make a glaze by stirring together 1 tablespoon dark rum, 1 tablespoon milk, 1 teaspoon vanilla and 1 1/4 cups confectioners’ sugar. Spread the rum glaze lightly on the cooled cookies. Add 1 cup raisins to the dough at the end of Step 1. Roll out the dough as directed, but cut into 2-inch squares. The dough will be quite sticky, so dip the knife in flour before each cut to make slicing easier.